I don’t have computer science background but mathematics & statistics plus keen interest to learn a lot. I have already finished 200 projects of Front end development but still feel like I don’t know anything. I can’t take a start or chose which development environment or platform or Cms should I use to develop my own website where I can apply everything whatever I am learning. Online search is all about clicks here and there, keep reading and clicking, everything is best. I can build a website on WordPress, Drupal or other cms but I don’t feel satisfied or you can it’s not what I really want. What should I choose if all is best Linux VM, vagrant, docker or windows subsystem etc. (one error breaks whole learning practices. What should I do if all is best and I know nothing more than reading and experimenting from laravel, react, angular and so on. I have domain Amazon aws account, I want to take start from a home page, develop, push to Github, host on aws, as I will update or edit page/s locally, it should push to Github and aws. Is it possible that GitHub can push to aws and I don’t need to touch aws. I am sorry if I am an off topic but look forward to your advise. Regarding your concern on choosing a stack to learn, Id suggest taking time going on popular job boards and searching for your preferred job description. Keep track of how many times you see certain frameworks/languages pop up, and learn the ones that pop up the most. This question pops up all the time, and it always depends on your personal situation. If you need to learn things to land a job, then stick to what I suggested above. Otherwise, learn as many as you can, make your own decisions on what you should stick with, and be awesome at them. Thanks for your response, I am not learning for the job but for something my own. I think i put little big post but the question is from where should i start. Let’s clear up a few things first. Github is for when you want to share/collaborate your work with others, or you want to show your code to others (say, as portfolio for a hiring manager to look at). The code is also PUBLIC unless you have the pro account and can make PRIVATE repositories. Understand the difference between Git and Github.com – they’re not the same thing. I think you have Analysis Paralysis. You have so many choices to pick from, you can’t decide for fear of making a mistake. Just pick one, use it. You can always change your mind later on, or for your next project. Development Environment: Whatever computer you have right now, that’s your pick. (Mac or PC). If you need a Linux VM (for running PHP, mySQL, whatever)… just install AMPP http://ampps.com/ and be done with it. Editor? You can pick one that is available for all kinds of platform, Windows, OSX or Linux — like what? 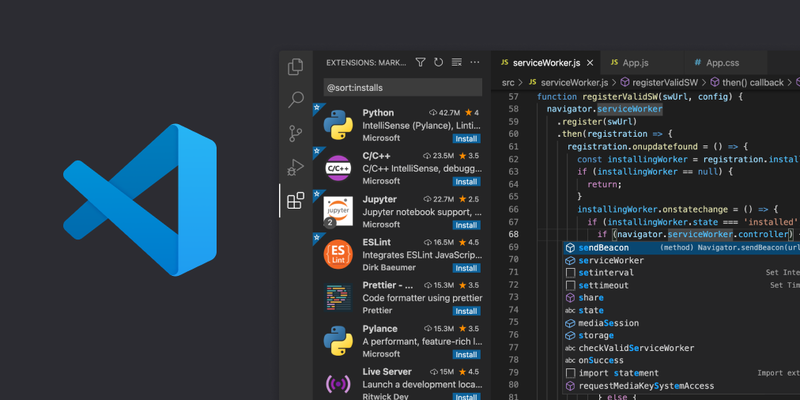 Microsoft Visual Studio Code. Framework/language: ??? This really depends on what kind of project you want to do. Pick your project/goal first, what you want to create, what you want it to do. Then that will tell you what framework/language you need to use. AWS: I think there is an Amazon CodeDeploy if you want to go from Github.com to AWS. (Again, understand difference between Git and Github). But if you don’t need server-side processing or databases, then you can use the simple Amazon S3 storage to host your website. You can use FTP to upload your files. Then just add a custom domain name to your S3 hosting using Amazon Route 53. Cost is about $0.51 per month for the Amazon DNS services per domain. Traffic surcharge may apply if you exceed free tier. Another option is surge.sh if you don’t need server-side processing. You can use custom domain names too without additional charge. Can u suggest me only one framework which is easy to learn and extend? Github: I think I can use it to show my work or challenges to others like yourself to get advice, plus friends can collaborate. If you’re using FCC to learn, then make life easier on yourself and use the stack that they teach.